EU foreign policy chief Federica Mogherini on Thursday urged member states to "take more responsibility" and ensure the bloc's migrant rescue operation continues to fight human trafficking in the Mediterranean. 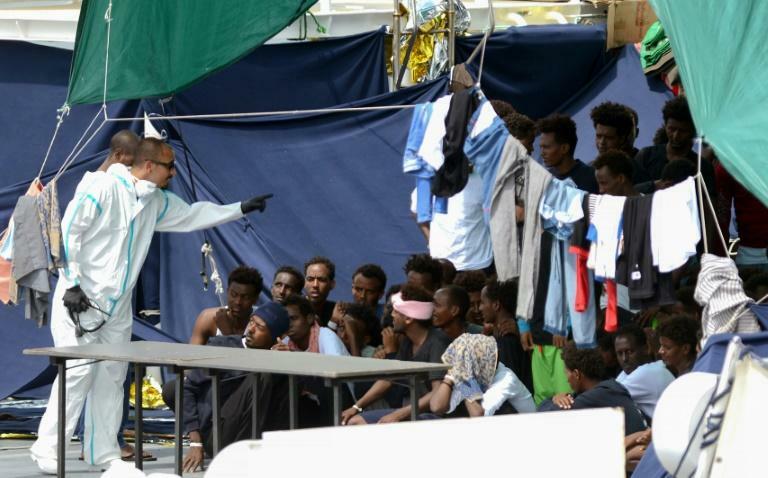 Rome plans to ask the European Union to modify the rules of the Sophia mission -- currently commanded by Italy -- and rotate the ports where migrants rescued at sea can disembark, with France and Spain expected to top the list. Currently all the ships dock in Italy but Rome's new right-wing, nationalist government says it should not have to carry the burden on its own and it is time other EU states do their fair share by taking in more of the migrants. In comments before informal talks by EU defense ministers, Mogherini called on them to show a "constructive attitude" to work to continue the mission. "So far consensus has not been found... We can definitely not afford to leave an EU operation without clarity on the rules it has to follow," she said ahead of the meeting in Vienna. "It would be good if member states take more responsibility," she added. "The important thing is that we manage to keep the operation going... This has been a remarkable achievement for all of the European Union." German Defense Minister Ursula von der Leyen said Sophia's mandate was until year end -- when she expected EU leaders to solve the question of how asylum seekers coming to Europe whose claims are recognised should be distributed among member states and how those rejected should be returned home. "By accepting our proposal it (the EU) will have the opportunity to show it is a real community of values and intentions; by refusing it will deny its own fundamental principles," she said.